For two weeks at the end of August 1967, 57 national and international attendees and their lecturers took up residence in the University’s Hamilton Hall, as the British Film Institute’s annual Summer School came to St Andrews for the first, and only, time. While the travelling Summer School was now well-established and had visited Scotland before, the 1967 school would prove to be one of the most significant and influential. At a moment when film studies was emerging as a discipline within some colleges and Universities, the BFI summer school brought together filmmakers, teachers, students and enthusiasts to mix, watch, and discuss an extensive body of often rarely-seen films. 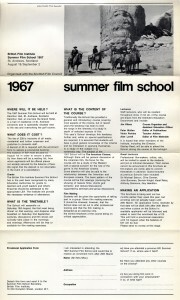 The 1967 school focussed in particular on the subject of the American western. 23 feature films were screened from thirteen filmmakers, with John Ford, Sam Peckinpah and Nicholas Ray most represented. Amongst the films shown were Fort Apache (Ford, 1948), The Man who shot Liberty Valance (Ford, 1962), Guns in the Afternoon (Peckinpah, 1961) and They Live by Night (Ray, 1948). During the late sixties there was an increasing critical interest in aspects of American cinema that had previously been dismissed as lightweight entertainment. The development of auteur studies and genre studies saw a renewed critical interest in the westerns of John Ford, for example. The summer school marks a significant early acknowledgement of this growing critical focus on American cinema. 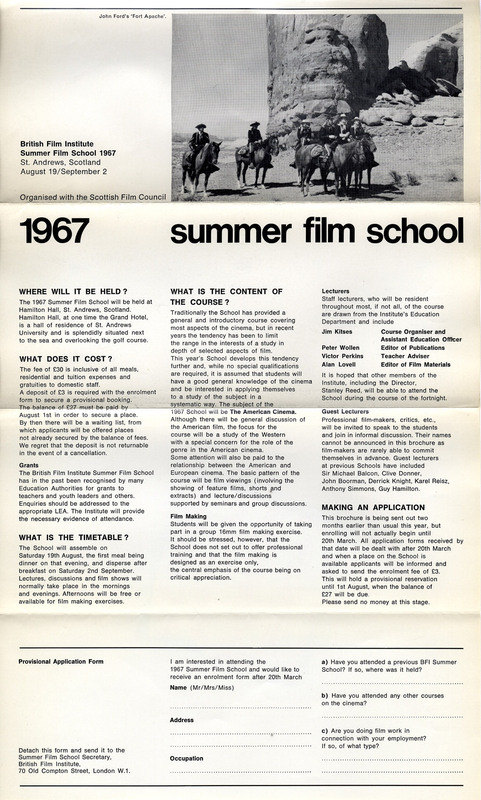 The Summer School had four main teachers, employed by the BFI – Jim Kitses, Victor Perkins, Alan Lovell and Peter Wollen – and four guest lectures, which included experts on the western, Robin Wood and Charles Barr. Amongst those attending the school were Ed Buscombe, who would emerge as one of the authorities on the American western. His article in the leading film journal, Screen in 1970, entitled The Idea of Genre in the American Cinema, would prove enormously influential, and sparked much debate, not least in a response from fellow attendee and future deputy director of the BFI, Richard Collins who published Genre: A Reply to Ed Buscombe also in Screen. Buscombe would also write books on John Ford’s The Searchers, Stagecoach as well as The BFI Companion to the Western and a BFI book, entitled 100 Westerns. Other significant attendees included Colin McCarthur, who published a piece entitled ‘Sam Peckinpah’s West’ in Sight and Sound immediately after the School. McCarthur would become an authority, in particular, on Scottish film. It is fair to say that many of the influential voices on the Western genre were in attendance in St Andrews in August 1967 and, for many, this may have been where they first saw these films as a body of work and where they formed and discussed what would become the defining writings on the genre. One of the lecturers Alan Lovell published on the subject in late 1967, while two years later Jim Kitses would publish his influential and often-revisited monograph on the subject, Horizons West. Also in 1969, fellow lecturer Peter Wollen would publish the still-widely quoted Signs and Meaning in the Cinema, which featured an extensive comparison of the works of John Ford and Howard Hawks (who both featured prominently at the school). Some 45 years later, one of the lectures at the School, Professor Charles Barr would return to St Andrews to give a talk as part of the University’s Centre for Film Studies. The subject of his talk was ‘John Ford’s Dialogue’. As an aside, two future Professors of Film Studies, Richard Dyer and Peter Evans, were studying in St Andrews during this period. Both studied modern languages (in the days long before Film studies was available at the University) and did not attend the summer school. Indeed, despite the apparent influence of the event on subsequent film criticism, there is no mention of the summer school in any local records or within the local paper. Anecdotally, it appears that St Andrews may have been selected not because it was an apposite venue for film education, but because the then-head of BFI education was a keen golfer.